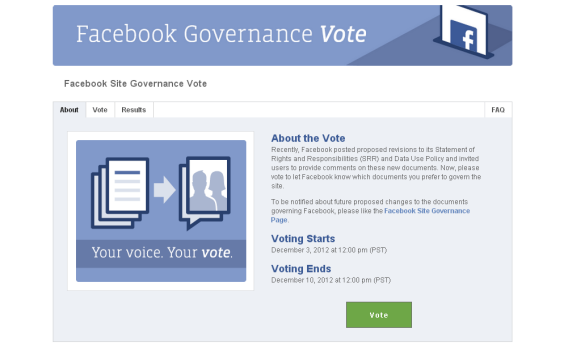 Facebook vote: Voting starts today on site governance, privacy changes. You Have One Week To Vote on Facebook’s Future. Here’s How. The final vote of Facebook’s brief experiment in democracy begins on Monday. Starting now, Facebook’s billion users around the world have one last opportunity to preserve their power to vote on changes to how the site uses their personal data. Since 2009, the site has offered its users an unusual opportunity: the chance to vote on changes to its governing documents. From the start, it set up the vote in such a way that only an unprecedented worldwide mobilization could actually have a chance of making a difference. Still, it was a fascinating toe-dip into democratic principles from a social network that counts enough users to rank as the world’s third-largest country. For understandable reasons, Facebook no longer feels comfortable ceding veto power over important decisions to its users. But to its credit, it is honoring its existing policies by allowing them to vote one last time to keep their right to vote. The results will only be binding if turnout reaches 30 percent of all users, or about 300 million people. No doubt some Facebook officials are crossing their fingers that the whole thing slides under the radar. But Schrage’s post says the company will bring in an independent auditor to verify the results, suggesting it’s serious about honoring its commitment. And while the voting app that Facebook has set up could be clearer in informing users just what they’re voting on, it does include a sharing mechanism, which seems like a good-faith effort to get the word out. Facebook’s blog post announcing the vote is here. The app on which you can cast your vote is here. Official explanation of exactly what you’re voting on is here. Slate has further background here and here. And at 12:30 p.m. eastern time Wednesday, Facebook will hold a webcast to answer users’ questions here.